We already showed you the new iPhone from every angle, inside and out. Today, Steve Jobs re-revealed it, telling us about the remaining details. Here's the exhaustive guide to all the features of the new iPhone 4. The hardware design hasn't changed from the one we already knew about. It uses the same materials as the prototype: Black glass and stainless steel rim. It fits with the rest of the Apple product line, from the hard edges to the Dieter-Ramsesque utilitarianism of the iMac and the iPad. The black glass is aluminosilicate glass. Apple claims this glass is "chemically strengthened to be 20 times stiffer and 30 times harder than plastic." According to them, this makes it more scratch resistant and durable than the previous generation. The size is smaller than the previous generation: 34% thinner than the iPhone 3GS. Although it is 3 grams heavier. According to Apple, it's the thinnest smartphone ever. It has split buttons for volume, unlike the current iPhone 3GS, all made in stainless steel. The A4 also consumes less power because its sub-components can be switched on and off when they are not needed, shaving watts whenever it's possible. The 3.5-inch multitouch screen has a resolution of 960 × 640 pixels. 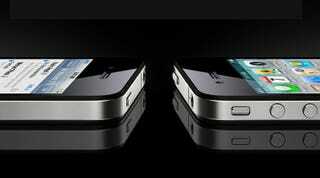 Apple calls is the Retina Display, and it has four times as many pixels as the current iPhone 3GS' display. The screen has 326 pixel per inch resolution, a higher definition than your typical magazine, a quality that shows in the screenshot. The new iPhone has a bigger sensor for the main camera. It's backlit and has bigger lenses too. Instead of having a higher resolution, however, the sensor maintains the same 5 megapixel count. They are bigger dots, however, so it has a higher ISO—or sensitivity to light. That means that you would be able to take better photos and video in low light conditions, and your pictures will look a lot better. In the front, there's a video conference camera, with standard VGA resolution. This camera will be used with third-party applications, as well as Apple's own video conference solution. The new iPhone 4 has a gyroscope built-in. This means that it can track movement with a very high precision, much higher than the built-in accelerometers in the previous iPhones. It's 3-axis, so it's capable of detecting pitch, roll, and yaw. Couple with the accelerometer, you have 6-axis motion sensing. The new iPhone 4 comes with iOS 4, a new moniker for the iPhone OS. The biggest new feature is, of course, selective multi-tasking, Apple's way to multitask some application features without consuming too many resources and battery power. The new iOS 4 supports Apple's Retina display using resolution independence. This means that applications will automatically get scaled for the new resolution, but looking sharper, not pixelated. That includes typography, 2D vector graphics, and 3D graphics. However, developers will have to include higher resolution images for buttons or other screen controls (something that many have already, since this was already exposed in the last WWDC). The new iMovie for iPhone works on even 720p high definition. You can use it to cut the video clips, add automatic Ken Burns effects for still images and a music soundtrack taken from your iPhone's tunes. After you are done with your movie, you can export it to 360p, 520p, and 720p. It's a separate application, however, it doesn't come built-in with the iPhone 4.
iBooks will also be available for the new iOS4. Apple claims that the new iPhone 4's 325 pixel-per-inch display will make the books perfectly readable. It will use the same controls as the iBooks application in the iPad. Click to viewThe Phone 4 will be available in black or white on June 24, and will cost $199 and $299 for 16 and 32GB if you are a new user or you are eligible for an upgrade. If you are an existing iPhone user, the early upgrade will cost you $399 and $499. Without contract, the iPhone 4 is $599 and $699. From the best iPhone apps and games to the biggest iPhone news stories and all the tips, tricks, & tutorials in between. Gizmodo brings you everything you want to know about the iPhone.